The quality product forms sequentially in the process of the successful performance of each stage of development. The attitude to definition of these stages can be different, but in general we determine 6 stages. The first stage presents the idea in definite limits. It is important to determine some needed technical characteristics of the product, model of collaboration, to calculate commercial efficiency of development. Then we create and approve the business plan, hardware-software conception of the product and we explore market concurrence. If it is needed we organize complex market researches and the mobilisation of the investment. Finishing off this stage is a production of a full packet of documents regulating product character and economical component of development. On the basis of the technical task, we determine development direction. We pass mathematic and technical modeling, allowing virtually estimate characteristics and possibilities for the final product. In the issue of modeling, we clearly form demands for the product components, determine their list and characteristics. At the same time we lead development of constriction documentation of creating the product. We buy all necessary utility with required characteristics for the creation of a prototype. At this stage it is possible that a certain change in the product is required for achievement in accordance with client’s requirements. Each such change is accompanied by correction of constriction documentation. As a result we receive a completely ready prototype of product on a basis to witch we can create a serial production of working models. During the stage of certification, the product passes some tests to determine possibilities of reliable service. A special organization composes the plan of testing, realises them and gives an expert's report about the results. This step is a method to exclude technical problems in future and to ensure financially. Ready samples of production are tested in real production conditions. This stage makes it possible to find any defects of product, which is only revealed in its interaction with other equipment. Finally testing of some models permits to correct conception and product producing. Finishing off this stage means a lot of working models, and a set of documents for serial production. 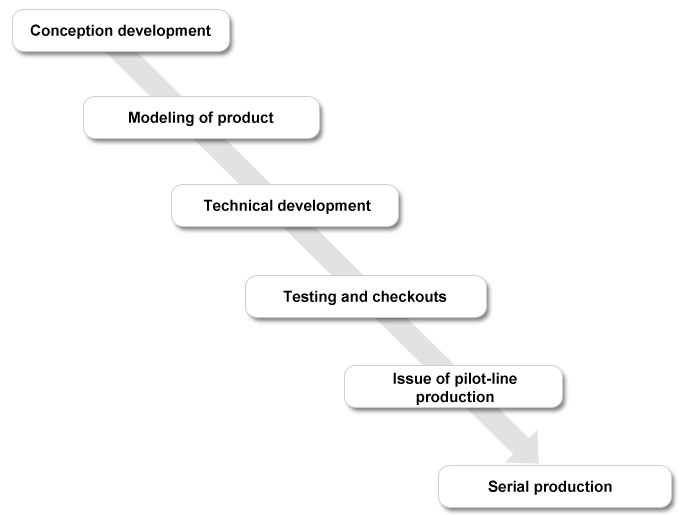 Serial production is the matter of creating a ready to use product on an industrial scale.